A while back, I touted this idea of taking the foreclosed properties owned by government-backed entities—Fannie, Freddie, Federal Housing Administration—off of the residential housing market and putting them into the rental market. Looks like it’s a go from the White House. –this can be done without Congressional approval, which is to say: it can be done. I’ve heard two arguments against the idea. One is that it’s a bad deal for taxpayers—I mean, we’re the “investors” behind these properties right now—who will get stung by firesale prices. Eh—maybe, but from what I’m picking up, that’s happening anyway. The return on these sales is already lousy. I’d just as soon try something that could help carve out a real bottom on home prices. 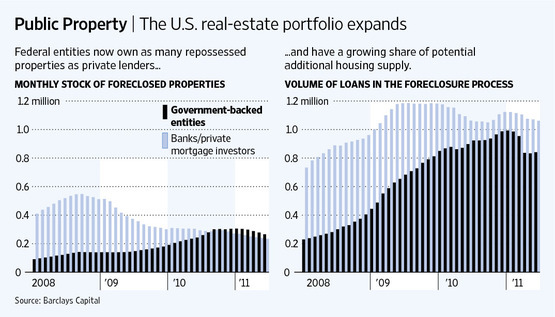 Second, investors buying foreclosed properties in bulk make lousy landlords. It’s a valid concern, but there’s a policy wrinkle in the FHFA/admin’s plan that should help: the proposal—the RFI noted above—should include requirements regarding property management and the Feds should reject proposals that aren’t convincing in that regard. The risk here is yet another housing program that’s undersubscribed and underperforms. But I still think this one makes a lot of sense and good for the administration and the FHFA for trying it. Share the post "A Good Housing Idea Gets a Try"
13 comments in reply to "A Good Housing Idea Gets a Try"
But how can we make sure only the “deserving” are allowed to rent? It will be interesting to see the details where the devil lurks. Could be just another heads I win tails you lose deal with wall street. Is it going to be a cash out deal for the government or are they going to finance it while the ever productive “private sector” creams the high value off of the top of the portfolio and gives the losers back to Fannie & Freddy? Sorry about all the pessimism but I’m not really sure we should be too excited anymore about anything where O’bama is involved in negotiating. After what the republicans did to him, I shudder at the prospect of wall street will do. Nevertheless, we need to do something on the rental side. If the equity of homeowners’ is unprotected from the fraud of financial intermediaries and their accomplices (i.e. Standard & Poors) as it is, then real estate is no longer a suitable investment for any but the most wealthy among us who can bear the risk and afford the legal challenges. This is where the fallacy of the “return of the housing market” lies. Owning such a highly leveraged asset that others can put at risk is not a suitable investment for an “average” investor. Most homeowners thought this conduct was illegal or they never would have bought in the first place; now they know differently and will be a lot more reluctant to get suckered into the scam. I think if these loans were consolidated into a local representative agency, like a federal land bank or a resolution authority, then a typical distressed homeowner could be told that: “You can not now afford the home you are in, but we have a smaller, less expensive home across town that you could move to and begin making payments on while preserving your credit.” A mechanism for such a musical chairs approach would hasten the resolution of the housing problem, potentially be a good deal for those who could qualify as well as the agencies involved, and it would lessen the number of homes put up for rental. 1. We have way too much housing for our population. That’s why the rental and homeownership vacancy rates are still well above historic norms. In a high unemployment economy, the two main drivers of house price increases are absent. Those drivers are a) increases in job creation and wages, and b) increases in household formation. Increasing the amount of rental housing, except in the few markets (like the DC area) where rentals are relatively scarce, will not solve the housing glut problem. Historically, in any given market, the median house price has been three times the median income. Here in my hometown of Tucson, Arizona, the median income (according to one of our city council members) is $32,000. Using the 3x median income, our median house price should be $96,000. It isn’t. Right now, our median house price is around $125,000, or almost four times the median income. On the rental side, the purchase price of your property should be 100 to 120 times the monthly rent that you can expect to collection. “Wishing” rents based on what you (over)paid for the house don’t count. I’m talking about the rents that the market will bear. So, if you’re looking at buying a rental house in an area where similar houses rent for $850/month, your purchase price should be $85,000 – $102,000. And, if I were you, I’d be looking to pay under $85k. Why? Because a lot of what’s on the market needs work. Major work. Which means that I want my purchase price as low as possible in order to cover the cost of repairs. After all, if you want quality tenants, you’re not going to attract them if you have dumpy rentals. Although I agree with what you are saying, doing nothing is not an option. Nonetheless, let me also add to your bundle of issues to contemplate — housing should be well below historical averages because we are in the middle of a once a century recession. Gosh, haven’t heard anybody mention that. So if the average price in AZ should be 85k in normal times, right now it should be lower than normal because of the recession, say 70k. If you factor in that a lot of these homes also need work (as you mentioned), and expensive work at that (copper thievery), than you are looking maybe closer to 60k to purchase a house before it makes economic sense within a historical view in that area of AZ. 60k is 1/2 of 120k. In sum, the pundits who talk about housing getting back in line with historical trends don’t seem to recognize we should be below trend in our current circumstances. Why not just buy up a bunch of these units and maintain them as permanent affordable housing? There’s little demand for high-end rentals at this point, but a lot of demand for rentals affordable to low-, moderate-, and now middle-income tenants. And there are plenty of non-profit affordable housing operations that could choose and maintain the units. Why not have the Govt. use the Habitat model of screening renters and setting up contracts. Plus, why not put folks in with a rent to buy deal. The most successful Habitat groups require extensive financial training plus sweat equity for recipients of their houses. Tons of middle and low-income families could use reasonable housing. Many landlords are just taking advantage of the situation with these folks. I’m with Pat in Colorado on the Habitat for Humanity model of screening. I used to volunteer with Habitat Tucson, so I have some personal experience in this area. Habitat requires that potential homeowners apply before they can even start working on their new house. And a lot of potential applicants get bounced because of credit issues. They’re encouraged to clean up their credit, then re-apply. Now, here’s where I think the Habitat model falls down: I don’t think that the homeowners were given enough help. Face it, if you’re coming out of a poverty-stricken background, that’s what you know. The skills needed to get into the middle class — and stay there — are not part of your life experience. I often thought that a lot of the Habitat homeowners could have benefited from a package of services involving local government, non-profit, and faith-based organizers. For example, local churches and governmental entities like community colleges could mentor the adults through the processes of upgrading their skills so they can apply for — and get — better jobs. Call it the Big Brother/Big Sister approach for adults. There might also be a role for Literacy Volunteers (and similar non-profits) to help those who need help with reading and writing proficiency. You’ve heard of a “New York minute”? That’s the period between the time a traffic light turns red and the car behind you in New York beeps its horn. Heard of the “Washington minute”? That’s the interval of time, even shorter than the New York minute, between when the Obama White House endorses something and the Republicans announce their opposition. I’m sure that’s true here as well. Durn it all, though, they have to take some time to come up with a reason for their opposition, and that takes longer, wouldn’t you know it! I bought an FHA foreclosure in Arizona a year ago. It took almost a year to find a house that I COULD buy due to bank policies and cash investors. All of the houses I looked at were foreclosed properties. Every time I made an offer the banks that held the properties would either accept a lower cash offer (as opposed to my pre-approved financing) from investors, or I would be out-bid by other buyers. The banks holding the properties simply did not want to deal with private buyers who required financing. There perspective was that the property may not meet FHA guidelines (and therefore require further investment from the bank) or that the “pre-approved” financing may fall through (which would require the bank to re-list the property). The only way I could buy a house was because FHA would not allow investors to bid on properties the first week that it was listed. If you remove THOSE houses from the market then you make it that much harder for people to buy. I haven’t figured out all fine points, but essentially the idea is to move homes to new owners in a variation of the RAM, thus (1) getting the home off the lender’s hands and occupied in way that promotes maintenance of the property by the occupant, because he now has an vested interest (2) getting folks with little income into their own homes by setting it up so that they build up their mortgage over time rather than make payments, etc. I can flesh this out, but basically all of my thinking derives from my familiarity with RAMs. The last thing a real estate professional will recommend is renting, and lenders really don’t want to be landlords. Or, we should consider ways to support and promote the individuals who have a proven record of fiscal responsibility and were not greedy in the boom times taking risks that were unreasonable despite being being popular. How about we make it easy for middle class working americans who already own a home (that is not distressed) to buy a 2nd home for investment purposes? Why does this have to be for large institutions? Home owners know what it takes to maintain a property and are smart enought to only take on what they can manage. Make the price right, help with financing and training on being a landlord. Reward fiscal responsibility… Don’t reward an finance industry that created this mess.